A Zenit rocket launches into space carrying Russia's Phobos-Grunt spacecraft toward Mars on a mission to collect samples of the Martian moon Phobos. 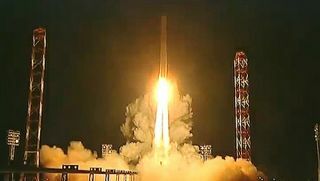 Liftoff occured on Nov. 9, 2011 Local Time from Baikonur Cosmodrome in Kazakhstan (Nov. 8 EST). Russian engineers are scrambling to try to save the Phobos-Grunt spacecraft, which was launched Tuesday (Nov. 8) but has failed to head toward Mars as planned. The spacecraft appears to be stuck in Earth orbit instead, after its engine failed to ignite to send the probe on a trajectory to the Red Planet. Now Russian Space Agency officials say they have two weeks to figure out how to start up Phobos-Grunt's thrusters before the spacecraft is lost completely. "They seem to be in a stable and relatively long-lived situation, so they have the most precious spaceflight resource -- TIME -- to figure out and implement an alternate command scheme," space consultant James Oberg, a former NASA space shuttle mission control engineer, told SPACE.com in an email. "It looks like they will try an orbit raise burn about 17:16 GMT [12:16 EST] today." The Phobos-Grunt spacecraft launched from Baikonur Cosmodrome in Kazakhstan at 3:16 p.m. EST (2016 GMT) Tuesday, and separated from its Zenit rocket properly, Russian officials said. However, the spacecraft's own engine then failed to burn when it was supposed to. Engineers hope that the issue might be a software program that could be fixed by rebooting. "I think the mission is eminently rescue-able, depending of course on the root cause of the problem," Obserg wrote. "If it's software, which is perhaps the most likely problem, there's time to load existing or thrown-together contingency commands." The $163 million Phobos-Grunt spacecraft is designed to land on Mars' moon Phobos, collect rock samples, and return them to Earth. The mission was intended to restore glory to Russia's Mars exploration program after three previous spacecraft intended to visit the Red Planet failed. "The go-for-broke nature of this mission, aiming for the first Russian deep space success in a quarter century, always looked awfully bold, and now looks just plain reckless -- whatever happens next," Oberg said.